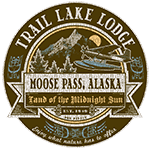 Moose Pass originated over a century ago as a layover point on the famed iditarod Trail and as a construction camp. The lodge saw its beginnings on the shores of Trail lake in the late 1940’s and for more than 40 years was a Peninsula landmark known as the Jockey Club. Renamed in 1989, Trail Lake Lodge has 22 rooms, a lakeside burled wood pavilion, a float plane dock and full service bar and restaurant. We are proud to have the reputation as “the place to visit” for all travelers and adventure seekers. It’s not white glove service, more like field gloves and warm mittens, but you’re family at Trail Lake Lodge and it’s our pleasure to make your stay exciting, comfortable and hassle free. We’re proud to deliver the best services in the most incredible setting Mother nature has to offer and complement your adventure travel experience with complete attention to every detail for a truly memorable stay at Trail Lake Lodge.